"The Wrong Woman to Mess With"
Cancer survivor Carol Dellinger has run three marathons this year. There is no way to keep up with Carol Dellinger. 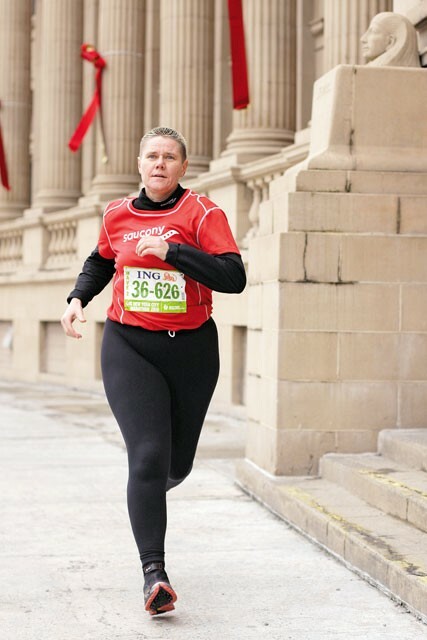 The 48-year-old woman is a caffeinated hummingbird — she talks fast, runs constantly and jokes often. Carol has a lot of titles — dental assistant, spokeswoman, motivational speaker — but two of her titles are more important than the others. They’re titles she combines a lot these days. In November, Carol ran the marathon of all marathons: the New York City Marathon. She ran it exactly one year after having a mastectomy. That marathon was the 245th she’s finished. Carol’s fight against breast cancer is one she intersperses with tales of running. In fact, she found out she had ductal carcinoma in situ (or DCIS, a cancer of the milk ducts) just after running the Portland Marathon. Carol says she is diligent about having an annual mammogram: her mother died from breast cancer, and she has several family members who have also had the disease. There was no question in Carol’s mind that she could beat cancer, but she had to put running on hold. She cancelled three marathons, though she told Dr. Moline she was committed to running the PF Chang’s Rock ‘n’ Roll Marathon in Phoenix in January. That was nine weeks after her surgery. “I told her I would be a good kid and do what I was told because I was going to beat this thing,” she says. After having her right breast removed, Carol eased into exercise again — walking five miles each day. “At six weeks, I had exceeded expectations. [Dr. Moline] said ‘go, get out of here … run that marathon,’” she says. And almost nine weeks to the day after her surgery, she crossed the finish line in Phoenix. And to thank her doctor, she framed her Phoenix Marathon finisher medal for Dr. Moline. After completing that marathon in Phoenix, Carol was back on track to meet her goal of running 500 marathons. New York — which she ran in November 2010 — was No. 246. Even before breast cancer, Carol’s running goals were ones lots of runners followed online. But after breast cancer, she changed the name of her blog from CarolDellinger.com to WarriorMarathonRunner.com. “I really feel like I was a warrior that went into battle and came out wounded,” she says. She says she runs not only because she can, but to celebrate — with each step — that she’s alive.